The laurel leaves are a symbol of honor for a scholar. Congrat the grad with a thoughtful and sophisticated graduation card. With diploma in hand, college graduates are a proud bunch ready to face the world beyond. Celebrate their special day and honor them in many ways including a congratulatory card. It's a great way to show you're proud and you recognize their hard work. Your brother has been working diligently over the years to get good grades and finish all his classes, and now his big day has finally arrived. 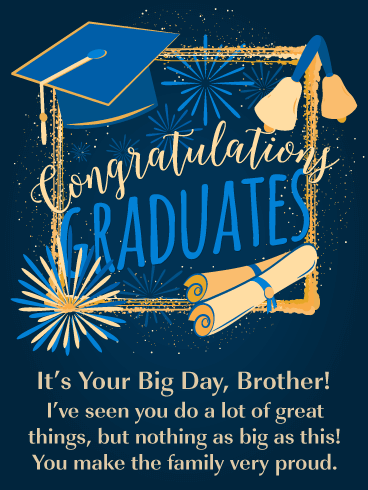 All his hard work has paid off and this excellent graduation card would be perfect to acknowledge your brother’s accomplishments. It features a detailed image of a graduation cap and diploma sitting on calendar pages! 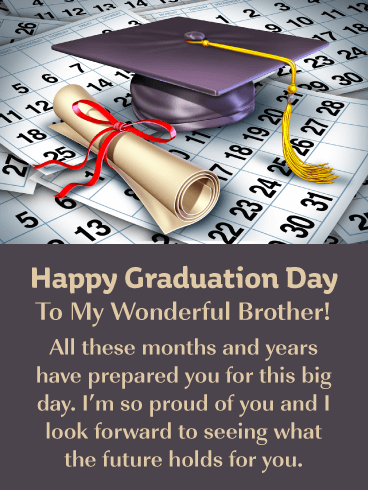 Be sure to make your brother feel great today by sending this graduation card on its way. 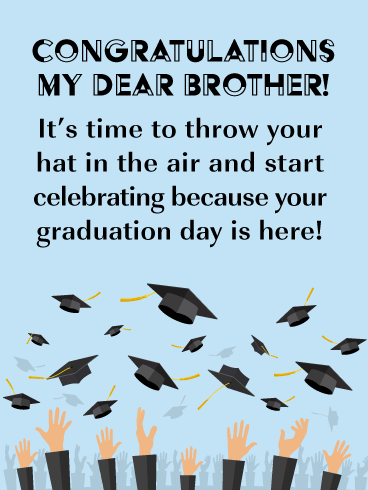 Say congrats to your brother and give him a little laugh with this fun graduation card! 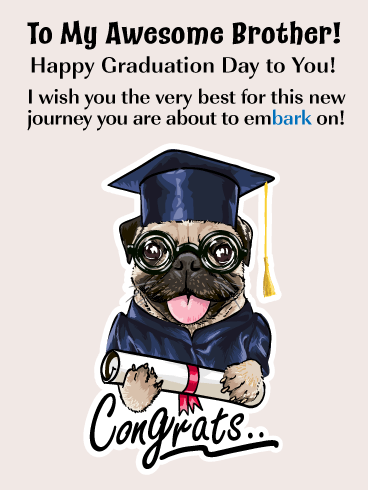 It features a silly dog wearing glasses, a graduation cap and gown, all while holding a diploma. The card’s message cleverly ties in with the image when it says that he is about to embark on a new journey! This is no ordinary greeting card and neither is this day! So send happy graduation wishes to your awesome brother today! 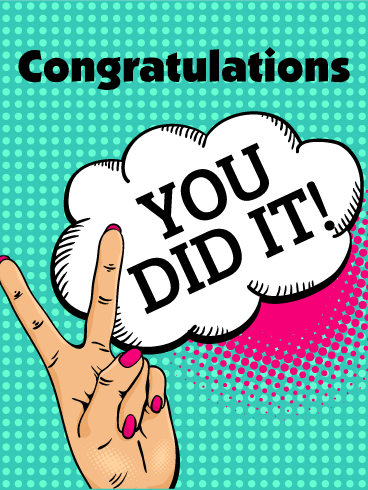 Bright, poppy colors give a retro feel to this fun graduation card, which says a lot in just a few words: "You did it! Congratulations!" It's a simple way to express how proud you are of their big accomplishment, and all the hard work that went into getting to this point. No matter how old they are, and what your relationship is, you're sure to make them feel special at this very special moment. There are absolutely no limits, nothing and nobody can stop your daughter. She’s graduated and the world is her oyster. You can’t wait to see what she does next. 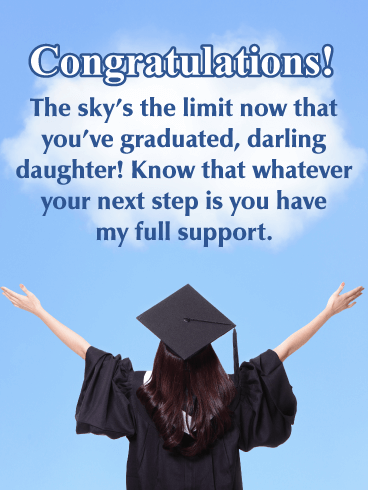 Send her the Sky’s the Limit Happy Graduation Card to let her know wherever she goes next she has your full support. You really couldn’t be more proud of your graduate! Is your daughter smart, savvy, clever…and maybe also a teeny bit of a goofball? 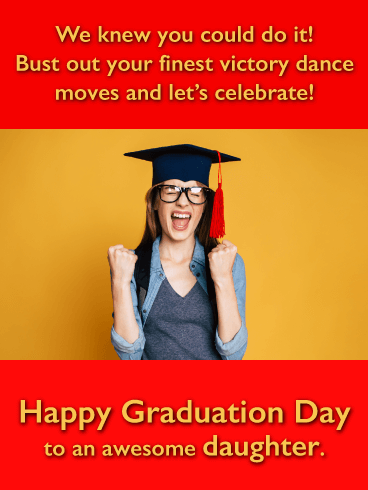 Send that Rockstar the Victory Dance funny Graduation Card to let her know it’s time to bust a move! Celebrate good times, come on! She’s worked hard and now she’s a graduate, that’s a big deal. Party it up, but first make her smile with this silly card. 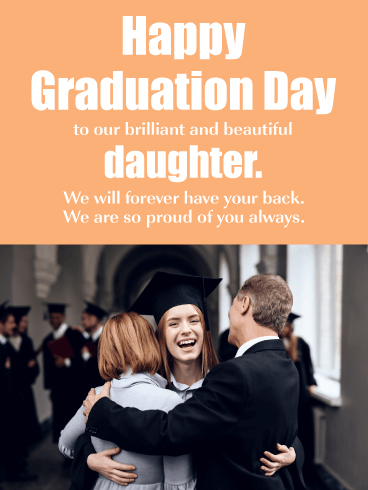 Send the heartwarming Group Hug Happy Graduation Card to your brilliant and beautiful daughter to congratulate her on her accomplishments. She needs to know that you’ll always have her back, even now that she’s all grown up and graduated. You’ve never been more proud of her than you are today and you can’t wait to see what she tackles next in life! 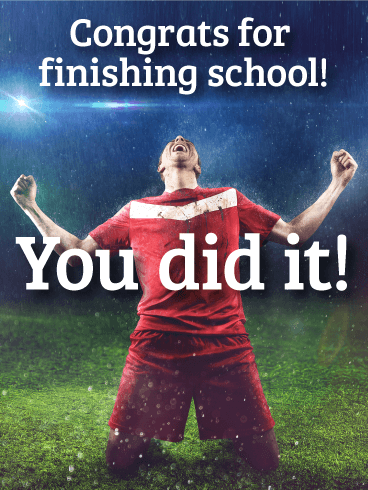 Your brother is finally finished with school – no more studying and no more tests! This means he can finally step out into the real world and start his career. Nothing deserves a congratulations and best wishes more than this. Which means it’s time to send your brother a card that says it all, and this graduation card does just that! 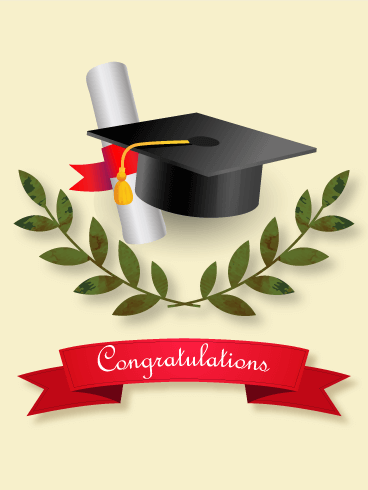 It showcases a smart owl wearing a graduation cap sitting above the words Congrats Graduate! He will appreciate the time you took to find him such a excellent card! 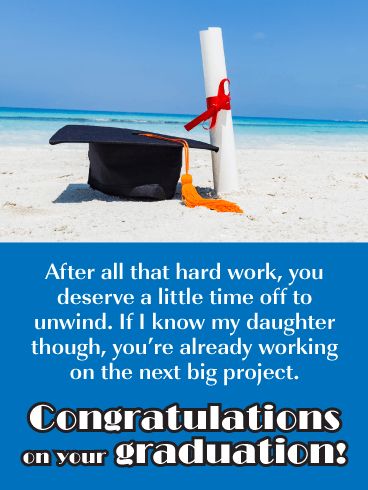 Remind your brother that it’s time to celebrate with this incredible graduation card! It shows students throwing their hats in the air in honor of graduating. This signifies that it’s officially time to start the celebration! 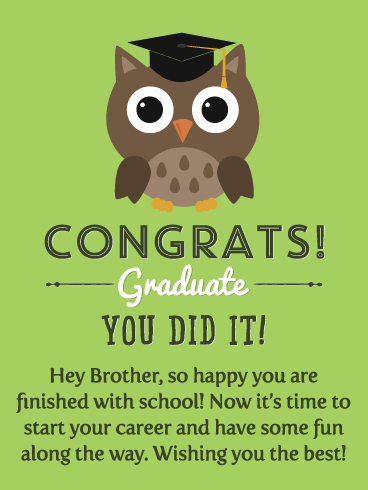 Put a smile on your brother’s face by sending this perfect graduation card his way. It will certainly make his day extra special! If anyone deserves a break, or a day at the beach if you will, it’s your daughter. She’s put in hours of work and graduated like a total boss! Knowing her though, she won’t lose momentum. Rather than taking a break she’ll be full steam ahead toward the next big project. So send that ambitious soul the Graduation Cap on the Beach Graduation Card to congratulate her! 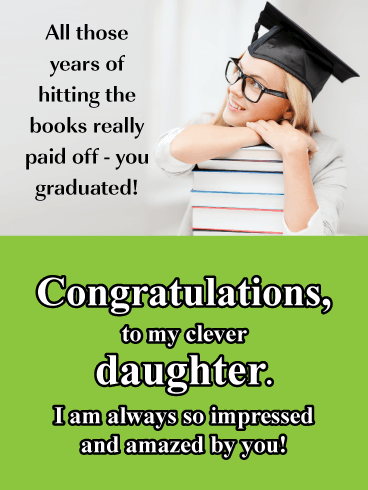 Just like the excitement and elation that comes from winning an important match or a big game, this graduation card will make your proud new graduate feel like an MVP! It's taken lots of hard work and dedication to get to this point, but it has all paid off in this one milestone moment, where they have proven to be victorious...and will continue to shine as they move on to life's next exciting adventure. Your daughter really buckled down and hit the books these last few school years. Her focus has paid off in spades including a diploma and a snazzy hat! Send that impressive young woman the Hitting the Books Gradation Card to let her know how you so admire her. She can do anything she puts her mind to, and you love her for it.